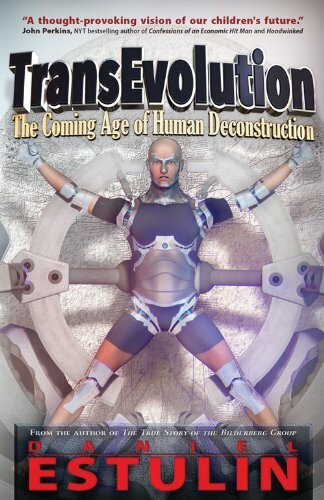 TransEvolution: The Coming Age of Human Deconstruction (2014) is an alarmist book by Daniel Estulin, a commentator on the secretive Bilderberg Group who is well-liked by many – in particular on conspiracy theorist forums. Essentially, this should be regarded as conspiracy theory material. My refutations of it are too many to cram into this review, so I will mainly focus on what the book itself says. Daniel Estulin connects disparate events and sources to depict an elaborate conspiracy. The main starting claim of the book is a link between the 2005 Bilderberg Conference and the 2006 document Strategic Trends 2007-2036 prepared by the British government (p. 1-12). Estulin claims that the latter report’s predictions betray “Promethean” plans that represent “designs by the Bilderberg Group”. The book makes the allegation that the economic pressure on the world today “is being done on purpose, absolutely on purpose. The reason is because our current corporate empire knows that “progress of humanity” means their imminent demise”. The “powers-that-be” destroy nation-states to maintain power, and “this is by design” (p. 13). Estulin decries international money flows and globalization, and promotes “physical economy” instead. To make a long story short, he describes the apparatus of globalization, integration, etc. as a clash between the nation-state and global oligarchy and frames this as a classic battle between good and evil respectively (p. 13-35). “The ideas of a nation-state republic and progress” are intrinsically connected (p. 34), Estulin argues, putting forward his preference for the old Jacobin ideological script of the Nineteenth Century rather than modern discourses on integration and communication. In his preference for the nation-state, Estulin attacks the WTO’s record on free trade, and makes criticisms that are provisionally valid. However, he confuses the tendency for weaker nations to be exploited through free trade with a conspiracy against the nation-state. The WTO’s commitment to what it calls free trade, a commitment to “One World, One Market”, reflects “anti-nation-state intent”, Estulin argues (p. 37-38). Although they attach too much agency to global “elites”, Estulin’s description of the way international trade on agriculture has been manipulated to disadvantage poor nations and advantage rich nations (p. 38-49) agrees with already powerful sociology theories of “free trade imperialism” and the larger humanitarian message of the alter-globalization movement. Estulin quotes William Engdahl’s The Seeds of Destruction at length to argue against the destructive local impacts of global agribusiness (p. 47-53). Estulin interprets the spread of the pharmaceuticals industry as evidence of the elite seeking a docile and controlled population, “massive drugging of the population”, “controlled chaos”, and even goes as far as to say that GMOs will be poisoning everyone on the planet and finally kill 3 billion people indiscriminately (p. 63-68). More puzzlingly than what has already been specified, Estulin blames the Club of Rome thesis itself (which predicted the depletion of resources leading to economic collapse) for making an enemy of humanity and submitting a plan for no less than the deliberate depopulation of the Earth (p. 17-20). Synthetic biology is not spared from criticism by Estulin. He immediately labels it as “founded on the ambition that one day it will be possible to design and manufacture a human being” (p. 69). For the record, nowhere in the field of synthetic biology has anyone actually advocated manufacturing human beings, and nor does such an ambition coincide with the conspiracy theory about depopulating the Earth. Estulin further confuses science with pseudoscience, stating “genetics, as defined by the Rockefeller Foundation, would constitute the new face of eugenics” (p. 71). “Ultimately,” Estulin writes, “this is about taking control of nature, redesigning it and rebuilding it to serve the whims of the controlling elite” (p. 72). In further arguments against the perceived “elite”, Estulin demonizes space exploration, saying “the elite are planning, at least, a limited exodus from the Planet Earth. Why? What do they know that we don’t? Nuclear wars? Nanowars? Bacteriological wars?” (p. 123) Chapter 4, although titled “space exploration”, is dedicated to explaining the deadly potential of future security and defense technologies when used by regimes against their own people (p. 115-156). Then, we get to transhumanism (only in the last chapter.) The chapter alleges that the US government thought up a transhumanist agenda in 2001 as a strategic military contingency – in particular the Russian 2045 Movement. According to Estulin, the transhumanist conspiracy in its present form comes from a conference, “The Age of Transitions” (p. 159-161). Using little more than the few links between political or business figures and transhumanism as evidence, he alleges that transhumanism is “steered by the elite” and that “we, the people, have not been invited” (p. 161-162). The movie Avatar (2010) by James Cameron (mistakenly named as David Cameron in Estulin’s book), is connected by Estulin with the 2045 movement’s enthusiasm for humans becoming “avatars” by means of being uploaded as digital beings (p. 162-164). Further, the movie Prometheus (2012) by Ridley Scott reflects the “future plans of the elite” according to Estulin (p. 165-170). However, he does not analyze either movie, and fails to note that Peter Weyland (the “elite”) in the movie is actually a vile character and his search for life-extension is a product of his greed and vanity (this is not exactly a glamorization of the search for life extension). If anything, Prometheus joins a long tradition of literature and film that encourages people not to trust transhumanism and life extension and to fear where such movements could lead. Estulin (and Engdahl’s) belief in a eugenic “depopulation” agenda (p. 57), as hideous as the crimes of Nazism, in Monsanto’s work is an example of a conspiracy theory appealing to irrational fears. Both of these writers are confusing corporate greed and monopolistic priorities with actual wicked and genocidal intent, and assigning motives that do not exist. They are confusing structural evils in the world system with actions by evil men gathered in dark rooms. Estulin also conveniently misses out the fact that the indiscriminate poisoning of all life by changing the DNA of every living thing would also threaten the conspirators and their own families. I guess we must assume that the conspirators are also a suicide cult, of the same breed as Jim Jones’ “People’s Temple”. At the end of the book’s tirade about synthetic biology being a ticket for the elite to control all life, Estulin reverts back to a question very prominent in mainstream fora: “can we trust the major corporations with the right thing?” (p. 74). The answer from almost everyone would be No – but not for any of the reasons Estulin has put forward. We can’t trust the major corporations, because their only interest is endless profit in the near term, and such profit is maximized by their ability to monopolize and detain real progress. Monsanto and other agri-giants are only vainly forestalling and trying to contain the real technium for their own greed – there is nothing radical about them. One thing I find ever entertaining about conspiracy theories is the tendency to get their ideas from Hollywood movies, while at the same time refuting the movies as an example of brainwashing and propaganda. Apparently, despite all their warnings to people not to be influenced by media, conspiracy theorists are incapable of noticing how impressionable and easily pressured they themselves are. The book even attacks Darwinian evolution and natural selection, seeing a sinister agenda in them (p. 179-180), which adds to the book’s already deep anti-science message. He connects the theory of evolution with the destructive idea of social Darwinism, and with transhumanism in turn (p. 190-191). The elite plan to “bring society down to the level of beast” by encouraging such social Darwinism, Estulin alleges (p. 211-219). Bizarre speculated connections between Malthusian theories, Darwin, the British Empire, eugenics and ultimately transhumanism (p. 174-178) do not take note of the fact that transhumanists and technoprogressives are the one camp in the world most opposed to Malthusianism. Technoprogressives are the camp with the most faith in the idea that the entire world can be fed and sustained. No-one has more faith in the infinite resources of humanity and the ability to meet everyone’s needs than the technoprogressives. Perhaps reflecting the book’s confusion, Chapter 1 is dedicated to asserting that the “elite” will reduce everyone to a primitive and chaotic setting, whereas Chapter 2 onwards alleges that the plan is a high-tech dystopia. These two polar opposite conspiracies do not coincide in any way, as do the paradoxical claims that transhuman technologies are never going to be seen by the world’s poor, yet are also going to be forced on the whole of humanity. The coverage of transhumanism and understanding of it in this book is not positive (to put it politely). It fails to take account of transhumanism’s real basis as a movement exploring emerging trends to change humanity for the better. Instead, it simply exaggerates marginal influences by futurism, popular science and technology enthusiasm on governments and business elites as representing a global conspiracy. A more informative theory about the relationship of the “elite” towards transhumanism would instead explore the habit of ignorant opposition by Neoconservatives, warmongers, and the mainstream media towards international peace, development, science, education, web freedom, and ultimately transhumanism.